Endorsed by the indispensable need to conserve energy, smart gas metering systems market has been traversing along a highly profitable path in the last few years. As energy management takes precedence, the demand for accurate resource usage records and billing has become more essential than ever. In this regard, rollout programs pertaining to environmental sustainability have been making a headway in the energy cosmos. Given the unbelievable advantages that smart meters possess over traditional meters, regional governments have been initiating programs that strive to replace traditional meters with smart meters. In consequence, these actions are likely to have an appreciable impact on smart gas metering systems market share. Having recognized the growing requirement to eliminate losses occurring due to gas distribution, energy companies have risen to the rescue to bring forth a range of advanced metering systems for accurate billing. Another essential factor driving smart gas metering systems industry is the increasing need to lower the operational expenses of traditional metering systems. Statistics depict that a large number of energy companies have been ordered to mandate the installation of a smart meter in every household. For instance, the UK government has provided energy suppliers with a target of getting a smart meter installed in every UK household and business by the end of 2020 or face heavy penalties in consequence. Naturally, smart gas metering systems market players have been pushing consumers to get these systems installed as soon as possible to not only mitigate unnecessary capital losses but also to optimize energy consumption for environmental sustainability. Smart gas metering systems industry has indeed successfully paved its way across myriad geographies, thanks to the numerous programs being conducted with regards to their rapid adoption. Recently for instance, Pietro Fiorentini announced that it would soon launch its RSE Smart Gas Meter embedded with 3GPP Narrowband-IoT connectivity in Europe smart gas metering systems market. Indeed, this is the first Smart Gas Meter along with NB-IoT connectivity that has officially received the approval of the European Union. The product’s trials have already been successfully carried out across countries such as Spain, Portugal, Estonia, China, Poland, Iran, Lithuania, Italy, Ireland, and Sweden. Europe incidentally, is considered to be one of the most lucrative avenues for smart gas metering systems industry and already boasts of numerous rollouts. The EU Gas Directive of 2013 had declared a target of installing more than 50 million smart gas meters by 2020 across the continent to stimulate smart gas metering systems industry. As per estimates, in 2017, the installed collection of gas meters for consumers almost doubled to over 17 million units in EU28+2, driven by the installations across Italy, France, the UK, and the Netherlands. In fact, Italy was the first European nation that deployed smart gas meters on huge scale. The National Regulatory Authority for Electricity, Gas and Water in Italy had actually set a target that 100% of industrial gas meters 60% of residential gas meters should be smart by 2018. With the lure of cost benefits, the deployments witnessed an upsurge since 2014, propelling the regional smart gas metering systems industry size. Speaking of the European turf, it is prudent to mention that the UK has a pivotal role to play in augmenting the regional smart gas metering systems market. The SMIP (Smart Metering Implementation Program) initiated by the UK government for instance, intends to replace 53 million electricity and gas meters in more than 30 million residential households by 2020. In order to simplify the rollout process, the UK government had set up a centralized entity – the DCC for providing a universal system for communications services for smart meters. The system went live in late 2016, post which the first half of 2017 witnessed a rollout of 0.8 million smart gas meters in the UK, adding up to a total of 3.1 million units. In late 2017, The Commission for Energy Regulation (CER) announced a massive EUR 1.2 billion project involving the replacement and upgradation of old meters. The plan aims to provide every home in Ireland with a new smart electricity and gas meter by 2024 and will lead to energy savings of around EUR 20 per year. Aided by a slew of programs such as these, it is undeniable, UK smart gas metering systems industry will garner commendable gains in the forthcoming years. China is another massive contributor toward the overall smart gas metering systems market share. The country’s government has been highly proactive in ensuring that smart meters are duly installed in the nation in order to save on excess bills. In 2015 for instance, the NDRC (National Development and Reform Commission) of China launched a time-of-use and ladder pricing structure for consumers across the commercial, utility, and residential sectors. Not to mention, numerous other initiatives for installing intelligent gas meters around the country have also been undertaken in China in the last few years. 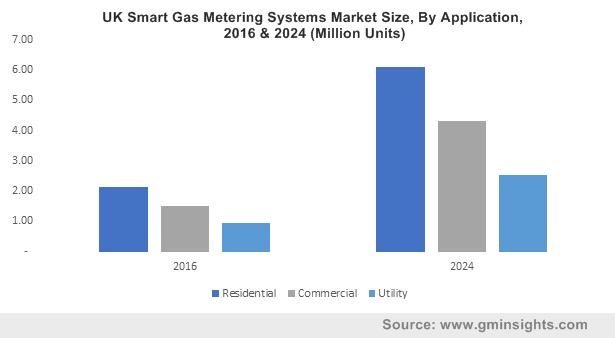 With growing consumer inclination toward smart meters and the support of a favorable regulatory landscape, China smart gas metering systems market size has been projected to register a CAGR of 25% over 2017-2024. It goes without saying that the overall smart gas metering systems market is heavily regulatory-driven. Given that energy conservation is a global issue of concern, it comes as no surprise that regulatory bodies worldwide and national and international governments have joined hands to conjointly find solutions for the aforementioned dilemma. Presently, the focus is to replace as many conventional meters as possible, with smart meters. In the years to come, this would enable acute understanding of real-time energy costs and contribute substantially toward energy conservation. Validating the fact is an estimate by Global Market Insights, Inc., that claims smart gas metering systems industry size to exceed 110 million installations by 2024.